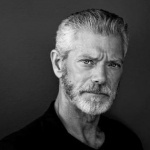 STEPHEN LANG is an award-winning actor known for his work on TV, film and stage. Lang is currently starring as Increase Mathers in the new WGN America hit series “Salem.” Lang will be reprising his role from James Cameron’s “Avatar” in the three upcoming sequels. He can be seen next in several films including IN THE BLOOD, PIONEER, and Stephen King’s A GOOD MARRIAGE. He was most recently seen in the animated film THE NUT JOB and was featured in the cast of the HBO documentary LOVE, MARILYN. Lang’s many films include LAST EXIT TO BROOKLYN, TOMBSTONE, GODS AND GENERALS, GETTYSBURG, PUBLIC ENEMIES, WHITE IRISH DRINKERS, CONAN THE BARBARIAN, CHRISTINA, and AVATAR. Film awards and nominations include Saturn Award for Outstanding Villain, The Grace Prize, MTV and Teen Choice Awards, Best Actor Buffalo-Niagra Film Fest, Outstanding Acting Achievement VisonFest X. Extensive work on TV includes Michael Mann's classic CRIME STORY, and TERRA NOVA. His extensive work on the New York stage includes A FEW GOOD MEN, THE SPEED OF DARKNESS, DEATH OF A SALESMAN DEFIANCE, THE GUYS, and HAMLET, as well as 101 critically acclaimed performances of his solo play, BEYOND GLORY at The Roundabout. He received the NEA Chairman's Medal for Distinguished Service for bringing BEYOND GLORY to American troops around the globe, as well as the Bob Hope Award from the Congressional Medal of Honor Society for his portrayal of American fighting men. Other theatre awards and nominations include The Tony, Drama Desk, Lucille Lortel, Joseph Jefferson, Helen Hayes, and Outer Critics Circle Awards. Lang holds Honorary Doctorates from Swarthmore College and Jacksonville University, and is a member of The Actors Studio.